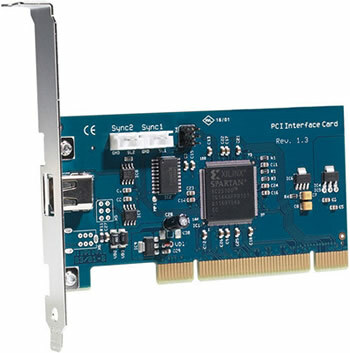 The connection between card and I/O box is established using ordinary firewire cable(Closed LAN to IEEE 1394). The data transfer does not use Firewire protocol, but our own proprietary bus protocol. The supplied cable is 4.5 m (15 ft.) long, a cable length up to 15 m (48 ft.) has been successfully tested. A specially designed Repeater can be used to reach cable lengths of up to 30 m (100 ft). The card does not provide power to the attached I/O-box. Therefore a hi-tech switching power supply is included.